“She sought adventure and she had courage,” says Wendy Aikens, who organized an exhibition about early English-Canadian watercolorist Edith Fanny Kirk at the Galt Museum and Archives in Lethbridge, June 6 to October 12. Watch for the full article in summer, 2015 issue of Galleries West magazine. 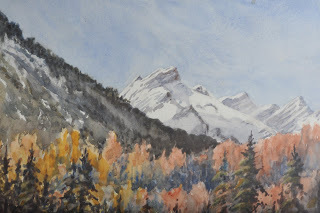 Watercolor painting above by Edith Fanny Kirk is entitled “Banff at November,” 1947.